Boosted by the compliant coverage of the Merkel visit by RTE and The Irish Times, Fine Gael media flakkers are firing shots at the few critics of the backstop strategy. Given only Dan O'Brien and myself have seriously challenged the backstop, and that I am not heard on RTE, you might think the Cheerfollowers and Posh Hibernians would think us not worth the bother. Perhaps it's a bad conscience. Here are four issues the Irish media avoided in ascending order of importance. First, no journalist challenged the Government's brazen reversal on the use of technology on the Border. Over the past two years I have repeatedly called for the use of technology and tariffs paid at source. Simon Coveney steadily and repeatedly rubbished these suggestions. But faced with the prospect of the EU erecting customs posts, Leo Varadkar became a sudden convert in the Dail last week. "Some things can be done remotely, the collection of tariffs for example. Customs duties can be collected as other taxes are, either online or into tax offices." Stephen Collins of The Irish Times, while supportive of the Government, is aware this reversal lays Leo and Simon open to charges of hypocrisy. "For some this means that the backstop was a contrived issue all along." As one of the ''some'', I am not convinced by Stephen claiming the Tories would have found some other excuse, especially after the ERG's volte-face. Second, last weekend the Irish media ignored Nigel Dodds repeatedly seeking some move on the backstop so the DUP could vote for May's WA proposal. Ken Reid, of UTV, tweeted that Dodds told him that if the backstop was addressed, "we would be in business". Christopher Hope, of The Daily Telegraph, also reported Dodds's call to revisit the Brady amendment. Dodds: "The PM should be on the phone to Varadkar and Merkel, saying this is what we need; let's get the deal done." So why no response from the Irish Government? The short answer is that the EU would not allow it. Tom McTague, in a recent Politico piece, records that as far back as October 2016, Michel Barnier arrived in Dublin with a clear message, "stop negotiating with the Brits". "What we can't do and won't do, because we have not throughout this entire process, is engage in any kind of bi-lateral negotiations with the DUP or any other political party, in the North or in the UK." In sum, a FG-led Irish Government has sacrificed control of Northern Ireland policy to the EU in return for Brexit solidarity - and our political correspondents neither noticed, nor cared. Third, no commentator pointed out the obvious when well-meaning Merkel, with an East German background, told us she knew about walls. No journalist had the bottle to tell us that the Irish Border was nothing like the Berlin Wall. The Berlin Wall was put up to keep German citizens from escaping from a repressive state. The Irish Border was originally a realistic response to a deeply divided community - but until 1971 was mostly invisible along its 310 miles. The Provisional IRA changed all that. The new militarised checkpoints were a desperate attempt to stop the IRA crossing, murdering and then recrossing to the security of the Republic. Finally, far from trying to calm down the tribal rages aggravated by the Irish Government wielding the backstop like a baton, the Irish media merely throw more petrol on the fire. Last Friday, The Irish Times gave a platform to Denis Bradley who seemed to be inviting us to join Northern nationalists in a righteous anger against the DUP for doing what the DUP were elected to do - protect their place in the UK. Naturally, I am not going to join any pan-nationalist project to put further pressure on Irish unionists. Long ago, in the pre-split republican movement, I was repeatedly warned by southern veterans that Northern republicans were different from us. How different became clear when the Provisionals' "war" descended into sectarian ethnic cleansing all along the Fermanagh- South Tyrone border. Henry Patterson, in his classic book Ireland's Violent Frontier, points out that during the 1950s the southern IRA leadership decided that part-time B-Specials would not be targets. Even after the Provo campaign started, in the seven years after 1972, only one UDR man had been killed in the area. Patterson believes this was because IRA leadership was still dominated by southern-based activists who had taken part in earlier border campaigns. But once the Adams Northern group took control the Provisional IRA targeted the UDR, which Protestants had joined for their own protection. 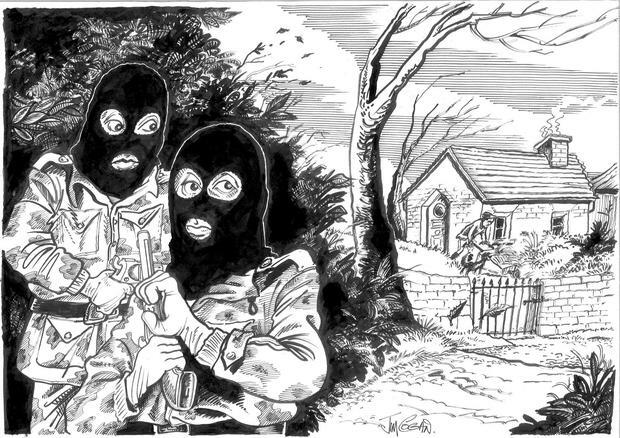 Between 1971 and 1989, nearly 200 Protestant farmers and shopkeepers were murdered. The systematic slaughter of the first born in these modest farm families was the single worst serial atrocity of the sectarian Provisional campaign. One of these defenceless victims was Douglas Deering, a devout Christian, married with three children, the last Protestant shopkeeper in Roslea in South Fermanagh. He had neither been in the B-Specials or the UDR. He was still shot dead in his shop on May 12, 1978. This campaign of ethnic cleansing cannot be widely known to the rising generation. In a recent Irish Times poll, some 45pc in the 18-25 age bracket said they would vote Sinn Fein. Brexit debates become more surreal. Last week, on BBC Newsnight, Kirsty Wark asked Dr Jennifer Cassidy, a politics lecturer at Oxford University, and a prolific tweeter from a northern nationalist background, if the EU thought Theresa May intransigent. Here is a literal transcription of her full and checkable reply. Dr Cassidy: "Yeah, very much so, and from an Irish standpoint this historical and political blindness that we have seen her blinkered on the goal of leaving, um, the EU under any circumstances and I was mentioning that I, you know, I received a text from my grandmother the other day saying, you know, you should never have heard this rhetoric. You should never have heard this hate that has, eh, eskew, like been espoused towards the Irish during the Brexit negotiations. And while we always knew it was there after the Good Friday Agreement, Brex... it was never, ehhh, it was never talked about or proclaimed so loudly and Brexit really showed a very nasty side towards the Irish. And for us, you know, the children of the peace generation we're called, em, you know, the comments I've heard, the rhetoric I've heard, as my grandmother said, this was something that, you know, people fought for and died for that we wouldn't have heard, meant to hear." Dr Cassidy has well over 41,000 followers on Twitter. None seemed to have struggled, as I struggled, to make sense of her reply. Once again I am seriously out of step.